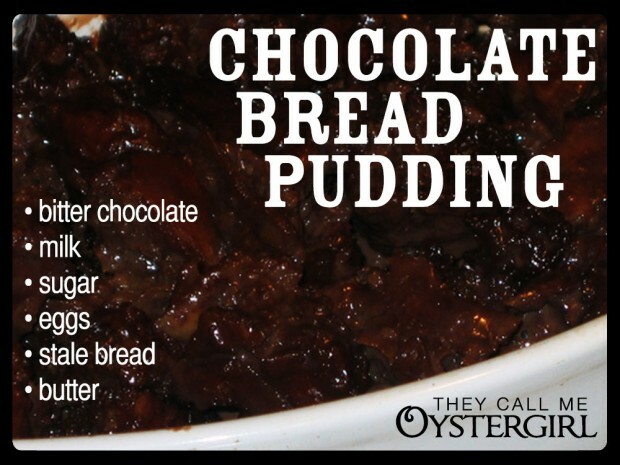 I grew up eating the most amazing chocolate bread pudding the world has ever known, which came from my great-grandmother. I’m not sure if it came from her originally; that’s as far back as I can trace it. My mother remembers that her mother often made it for my grandfather (who would have grown up eating this pudding). My grandmother would leave it to cool on the windowsill, and when my grandfather would come home from work and get one whiff (it’s all you need), he would proceed to eat the whole thing straight from the pan. Heat milk and chocolate and salt and sugar. Gradually add some hot mixture to the beaten eggs (so the eggs don’t cook), then pour into the rest of the milk/chocolate mixture. Add bread and stir in. Pour into greased casserole dish. Dot with pieces of butter. If your bread isn’t very stale, or you only have fresh bread, bake the bread until it’s very hard. Let it stand after baking for no less than a half an hour. It’s very soupy when it’s first cooked; standing will let it set. Have the oven ready, and put into a hot oven right after stirring everything. I somehow remember that if I let it cool before cooking, it wasn’t quite right.